I’ve been thinking a lot about ‘pleasure’ this month – seems appropriate as we are in the Sagittarius phase, which has plenty to do with loosening up and having a good time. I’ve been reflecting upon just how much pleasure I have derived from my experiential encounters with the astrological wheel over the years – my deepening awarness of, and rootedness in the wheel. It’s a learning journey that can never be exhausted, just revealing more and more layers of depth and subtlety – and with it, ever greater possibilities to simply enjoy the transformational ride! The 16th century G erman mystic Jakob Boehme said: “The essence of God is like a wheel…the more one beholds the wheel, the more one learns about its shape, and the more one learns, the greater pleasure one has in the wheel.” I’ve spend a lot of time contemplating this quote and the more I work experientially with the astrological wheel and with the wheel of the year, and the seasonal transformation it relates to, so it continues to reveal even more profound layers of meaning. The “wheel that turns” is a common motif in many traditions. 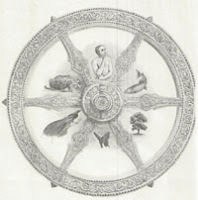 In Buddhism, it is most often related as the wheel of samsara into which the immortal soul incarnates to experience the transformational cycle of birth, desire, suffering, death and re-birth. It is the wheel of karma, where we experience ourselves “in the world”, the aim being to find balance or peace, to become aware of the turning wheel of samsara that we are bound within, and, in doing so, free ourselves from suffering. The wheel of samsara reflects, of course, the turning wheel of the year through the seasons, Spring, Summer, Autumn and Winter, and then relates this directly to the human experience. One of the primary features of a turning wheel is that it has a point at its centre that remains still – yet is the fulcrum point from which all the energy from the turning wheel emanates. I have come to equate this stil l point at the centre of the wheel as the point of awareness, where we are aware of the turning around us, yet, as we hold our presence at the centre, can remain unmoved by it. In the Samsara model, I equate this point with an experience of nirvana, an experience of simply being, that we access through the stilling of the mind. The more able we are to access the stillness at the centre of the turning of the wheel, the more able we are to move back out into the wheel and simply enjoy its turning for what it is. If we are not practised in accessing this centre, then we will tend to experience the wheel as dangerous, frightening, and its inevitable turning as something to be fought against and resisted. As Boehme says, the more we learn about the wheel and how it functions, the more awareness of the cyclical nature of life’s wheel and its irresistible turning, the more pleasure we can have in that wheel and so we can become free of suffering. This, for me, is that heart of true alchemy, as I believe it is the heart of all true spiritual practice. Ten days ago, Anthony Thorley and myself ran a weekend introduction to The Alchemical Journey in Glastonbury, called “Awaken the Alchemist Within”. It was a magical weekend with huge amounts of learning all round – and as I have reflected upon it, so many insights have been dropping – like golden raindrops! The weekend was based upon an experiential journey around the whole wheel of the year – through each one of the 12 signs of the zodiac. We did this primarily through music and movement, envisoning our playspace (the upstairs room at Glastonbury Conservative Club!) as that ever-turning wheel with the still point marked at its centre. And so, on the Saturday, we danced our way around the wheel from Aries to Pisces, responding to music and visual cues that resonated with each zodiac sign and each of the 12 stages within the annual seasonal round. We began our journey by focussing at the centre of the wheel, and after we had experienced fully the energy of each zodiac sign, we returned to the centre, consciously releasing our involvement with the energy of each sign. By following this structure each time, we were able to realise deeper and deeper within our embodied experience, how, no matter how far we have abandoned ourselves to each stage of the unfolding drama, we can always return to that still place of awareness at the centres. Indeed, what we all found was that the more we rooted our experience in that centre point, the better able I think we became to consciouly abandon ourselves to the dynamics of each sign, dancing ever more passionately, whether to the bright harmonies of Libra, the discordant rhythms of Scorpio, or the off-the-wall jazz beats of Aquarius. I would say that the more connected we became with the centre, the more pleasure we we were able to experience in the wheel. On the Sunday of our workshop, we focussed on the sign of Sagittarius and the day culminated in Anthony guiding us on an extraordinary walk around the figure of Sagittarius in the Glastonbury landscape zodiac, a series of 12 figures stretching out across 10 miles of the Somerset Levels- marked out by rivers, roads and field boundaries, and identified by artist Catherine Maltwood in the 1920s, and ever since linked with and identified Arthur’s knights of the round table – the round table being the reflected in the perfectly flat landscape of the Somerset levels, in which these figures are found. The Sagittarius is by far the largest of the 12 figures, rather unsurprisingly perhaps for this larger-than-life, Jupiter-ruled sign. Depicting a centaur (or else rider and horse), this figure has been indentified as Arthur hims elf and all sorts of clues in the landscape features and place names suggest some kind of shamanic-healer figure, not unlike Chiron, the mythological shaman-centaur of Greek mythology. The arm of the Sagittarian figure reaches deep into the heart of the zodiac and his finger almost touches the very centre point of the wheel. This point is marked in the landscape by a dense and rarely visited wood, called Park Wood. We ventured into this wood on the Sunday afternoon and stood around a particular tree at the centre point of the zodiac. It was an extraordinary experience and I personally felt the most incredible sense of peace and stillness there. Again, an embodied recognition of the power of the still centre. 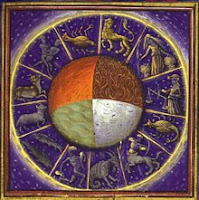 It was our starting point for the ritual journey around the profile of Arthur / Sagittarius that was to follow. Having stilled ourselves, we were ready to venture out into the fiery energy of the Sagittarian figure – better able I believe to really abandon ourselves to the pleasures of walking in the wheel. These are my reflections for now on this experience. I will perhaps add more to them over the coming months. I really welcome any comments and feedback. You can respond by clicking the ‘comments’ link below. Visit www.thealchemicaljourney.com for more information about The Alchemical Journey – and come on board for the ride of your life!